The confirmation of two new outbreaks entails that now there are 27 affected regions and that almost 1,000,000 animals have been culled. 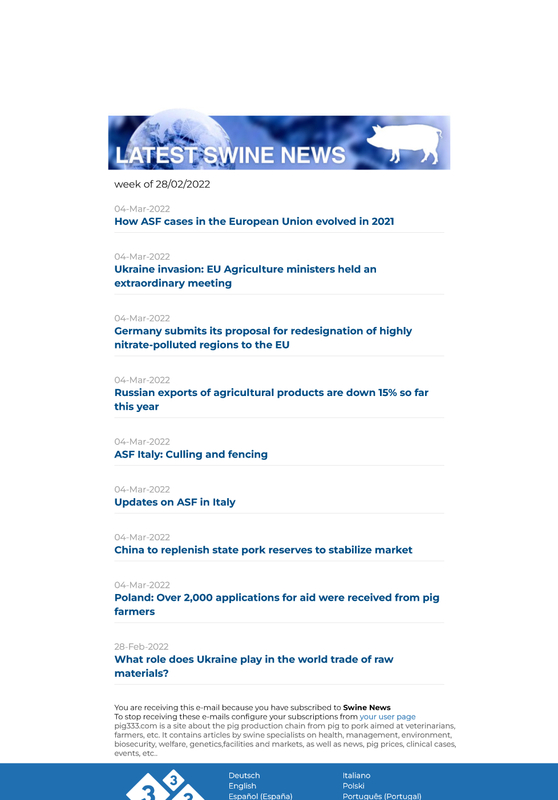 The Ministry of Agriculture of China informed yesterday and also today of the emergence of two new outbreaks of African swine fever in two new provinces, namely Guangxi and Shandong, that so far had not been affected by outbreaks of the disease. The Beihai (Guangxi) outbreak affects 23,555 susceptible animals, whilst in the case of the Jinan (Shandong) outbreak it affects 4,504 susceptible animals. In early February, another outbreak was confirmed on a farm with 4,600 susceptible animals located in the province of Hunan. With these two new provinces, now there are 27 provinces/municipalities/ autonomous regions affected by the disease, more than 100 confirmed outbreaks and almost 1,000,000 animals culled, according to data provided by the FAO. Tuesday, February 19th, 2019/ MoA/ China.